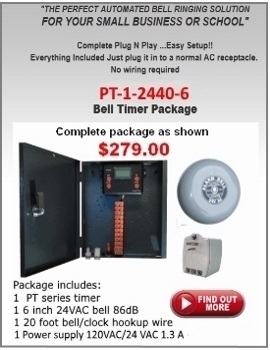 FOR YOUR SMALL BUSINESS OR SCHOOL"
Complete Plug N Play ...Easy Setup!! Everything Included Just plug it in to a normal AC receptacle. 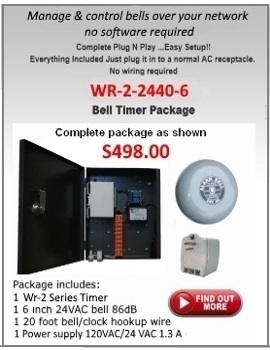 We Specialize in School Bell & Factory Bell systems. 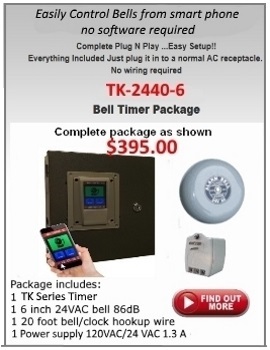 Belltimers.com can design from new or integrate into any existing bell system. We have simple stand alone timers to network controlled timers. If you have a existing system with tone over paging then we can upgrade that any one of our custom made timers can be outfitted with a tone out to broadcast over an existing paging system.